Born on this day in 1879, Wallace Stevens (1879–1955) gives hope to poets of a certain age as he was not published until the age of 35. In fact, the Harvard educated insurance executive's best work was not produced until he was in his 50s. He won the Pulitzer Prize for Poetry for The Collected Poems of Wallace Stevens in 1955. As memorialized in New York City, it is the fifth verse of, Thirteen Ways of Looking at a Blackbird that is enshrined on Library Walk. 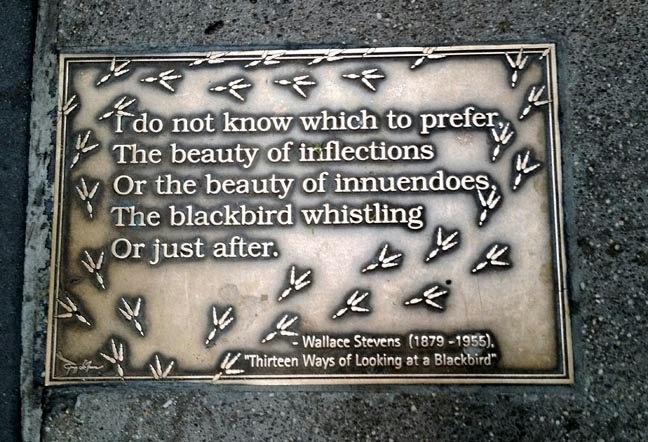 One of Wallace Stevens' earlier poems, Thirteen Ways of Looking at a Blackbird was first published in 1917 by Alfred Kreymborg in Others: An Anthology of the New Verse. Whether it be a birthday, anniversary or publication date of a seminal work, the Bar None Group will revisit these 40+ quotations from time to time — quotations that inspire one to write, read, explore and embrace literature. We last visited Nobel laureate William Butler Yeats.